You can set the Foreground or Background properties of a control to a brush that will render the control using one of the predefined system colors. The SystemColors class contains a number of static SolidColorBrush objects representing brushes that match the system colors. 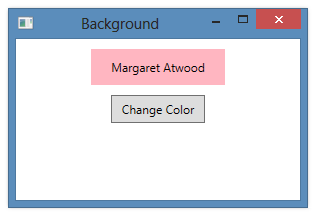 <Label Name="lblMA" Content="Margaret Atwood" HorizontalAlignment="Center"